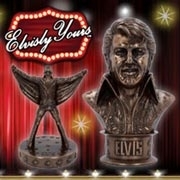 Exclusive to Nemesis Now, this enchanting clock is a part of our Elvisly Yours collection. On stage in Hawaii, a garland of flowers around his neck, the King sings soulfully into a microphone, eyes closed. His name is spelled in lights behind him in front of a red curtain. With each hour marked off in gold, this fantastic wall clock is truly timeless.